There doesn’t seem to be much of a learning curve for Green Lanterns these days. At least, if Simon Baz and Jessica Cruz’s experiences are any indication. It’s been a little less than a year since Hal Jordan fused their two power batteries together in a bid to force the rookie Lanterns to work together. So far, it seems to have worked. Over the course of twenty issues, Simon and Jessica have confronted the Red Lanterns, the crazed Phantom Lantern and even a Sinestro Corps-channeling Scarecrow…but the two fledgling heroes are currently facing their biggest challenge yet, as they attempt to bring down the newly escaped Doctor Polaris. We recently caught up with series writer Sam Humphries, who shared some insights on bringing this classic villain back and what he can teach us about Simon Baz. In addition, Sam offered some teases about what lies ahead for our two heroes, including a trip to outer space and a major confrontation with the First Lantern himself, Volthoom. Your current storyline has Simon and Jessica going up against Doctor Polaris. How long has this storyline been in the works? When did you learn that DC was bringing Polaris back? I just liked the opportunity. He’s a great Silver Age character—a classic Green Lantern villain. He has a fantastic power set. He’s extremely powerful. He should be one of the heaviest hitters in the DC Universe. To have the opportunity to refresh him for the Rebirth era, and to really dig down and identify a solid emotional core for him was a privilege and a lot of fun. The first chapter’s out and people are already hitting me up online on Twitter about various things about him that I’ll tease out—his mental illness, his working in tech and his desire to save his brother. People have really been responding to it, and it’s very gratifying. Speaking of Doctor Polaris’s brother, when I read issue #19, I couldn’t help but be reminded of Simon and Nazir. Both characters have felt the frustration of having someone they care about struggle with illness, but Simon actually was able to use his tools to help Nazir. Do you think that sometimes, something that simple could be the difference between someone becoming a hero or a villain? I think sometimes, yeah. Doctor Polaris is brilliant, but he has bipolar disorder and he’s never gotten himself treatment for it. His brother has brain cancer. These aren’t things we can choose to have or not have. These are the slings and arrows of life. It’s not the challenges in your life, it’s the way you handle them, and I think sometimes, yes, that is the difference between a hero and a villain. We also got to see Volthoom’s backstory as well, which was pretty amazing. When will we be seeing the First Lantern again? Extremely soon. I’m writing the script right now, and I’m going to tell you that this Volthoom story, we’ve been building up to it for a long, long time, and there’s a reason for it. This is going to be a very big story. He is a major Green Lantern villain, and we’re going to take him to places we’ve never seen him go before. The last storyline he was in with Geoff was a great story, but he was this god-like figure, and now we’ve kind of taken him down a peg. We’ve depowered him. We’ve put in an impossible situation, and he’s just a guy who wants to get home. He’s a guy who wants to save his planet, right? What it reminded me of was Voldemort at the beginning of Harry Potter. He’s a shadow of who he was, but still dangerous and you know something’s coming. 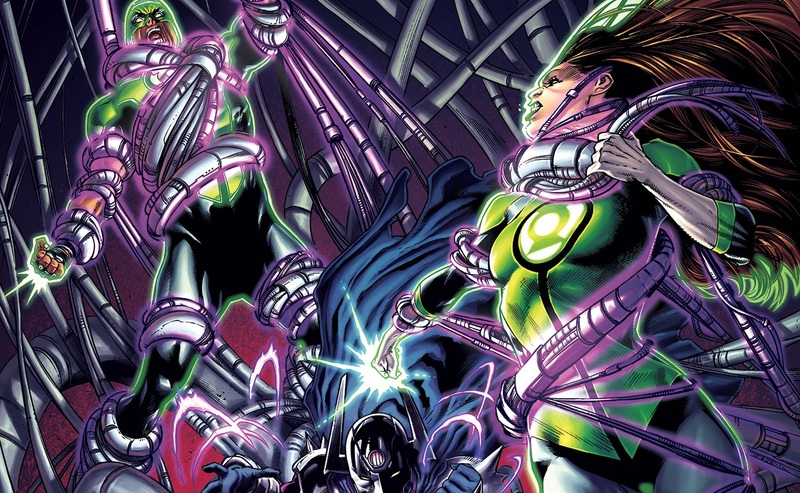 What we’ve seen has really been a rebuilding of Volthoom and in that process we’ve gotten to know him. We’ve started to feel for him a little bit. It’s the sort of process that moves a character away from being one-dimensional. It takes a villain away from being too mustache-twirly. It takes a hero away from being too unrelatable. Issue #25 is called “The First Lantern Returns,” and that’s where some of this is going to culminate, but also a lot of things are going start with it. The storyline that comes out of issue #25—our extra-sized anniversary issue—is going to be big. I can’t even say some of the proper nouns involved. It’s going to be awesome! So far, Green Lanterns has taken place entirely on Earth, but in a few issues, you’ll be taking Jessica and Simon to space for the first time. Not just to space, my friend. They’re going to Mogo. Simon and Jessica really got thrown into being Green Lanterns on Earth without a lot of backup, and in the case of Jessica, zero training. So there are some developments happening in the story where John Stewart has said that they need to be brought in. They’ve been out in the cold too long, and now that the Corps is a little more settled, they can finally get some training. Some faces you can look out for in that story are John Stewart, Kilowog, Guy Gardner, Kyle Rayner… It’s a lot of fun. Out of the characters I’ve listed, one takes on training Simon and one takes on training Jessica, and the results are explosive. Have you been looking forward to telling a cosmic Green Lantern story, or do you prefer the Earth-bound super heroics? Well, both. I think setting the book on Earth has really made it what it is. It’s a nice contrast with the other book. Exactly. Rob’s writing a fantastic book out in space. I’m writing a book set here on Earth. It gives both of us a lot of room to do our thing. Being able to have these specific characters—Simon and Jessica—who are relatively new to the ring, on Earth and having their families as supporting cast has really made the difference. That said this is Green Lanterns, this is science fiction. We’re about to go to some big places with issue #25. We’re going to see a shift in setting for this book, and it’s going to be huge. Finally, we’ve learned so much about who Simon and Jessica are as characters through their relationship with each other. If you had to guess, do you think this is a lifelong partnership they’re forging here? Or do you suspect they’ll go their separate ways eventually? Do you think that’s necessary? I think that life is all about change. That’s especially true in the DCU where you have to deliver a new story with every issue. Who knows what will happen after my run? Who knows what will happen during my run? I think what we can say about what Simon and Jessica have been through so far is that they have had an experience together that will always bond them. They will always be, in some sense, partners. They will always be friends and be there for each other. They will always share an experience that no one else has had. Whether or not they’re partners in a formal way forever…who knows? Will they always be in the same book together…who knows? Will they even have the same color rings forever…who knows? But I think the experiences that they’ve had will bond them for the rest of their lives. GREEN LANTERNS #20 is now available in print and as a digital download. The most recent Green Lanterns collection, GREEN LANTERNS VOL. 2: THE PHANTOM LANTERN, will be available in comic shops everywhere on April 26th.